I’m not much in the habit of doing fan art any more, but every now and then I just can’t help myself. I’ve been wanting to do Captain Marvel since she was redesigned, but I never really got to it — until a friend designed a hipster variant that she’s crocheted for a pretty amazing piece of cosplay. I guess I wanted to celebrate her and her amazing craft more than anything else, so how could I resist? 6″ x 8″. Watercolor on paper. Captain Marvel is copyright Marvel Comics. Isn’t she wonderful? Yeah, she kinda is. Last year I had the opportunity to show some work with a dear friend of mine and we both independently settled on doing super hero pinups. I already posted Mystique, but I thought that now would be a good time to get back into showing the rest of them. Wonder Woman was the only one I was absolutely sure was going to be included in the show, but I didn’t want to give her the same spandex treatment she normally receives, so I went more in line with the Greco-Roman Legionnaire aesthetic. And now I just want to draw her like this all the time. 8″ x 10″. Watercolor on paper. I promised to draw Nora Valkyrie — a character from a web series titled RWBY — for one of my friend’s daughters if she got caught up on a comic project she’s doing for school. 9″ x 12″. Watercolor on paper. Back in November I had an opportunity to show some small paintings at a coffee shop here in town. I was fortunate to share the show with a dear friend of mine. I honestly can’t remember how we both wound up doing super hero pieces (I think it just wound up that way) but in the end I did twelve small watercolors — six from the Marvel universe and six from the DC universe. Sometimes I find myself stuck with nothing much else to do, a sketchbook, and my watercolor kit. When that happens, how could I not spend my time making silly little drawings? These little paintings are getting fun. So, I know of I kind of just posted this image, but after my last post someone commissioned me to do a colored version of it. Redoing this piece was pretty exciting to see what’s changed in the style in the past year. 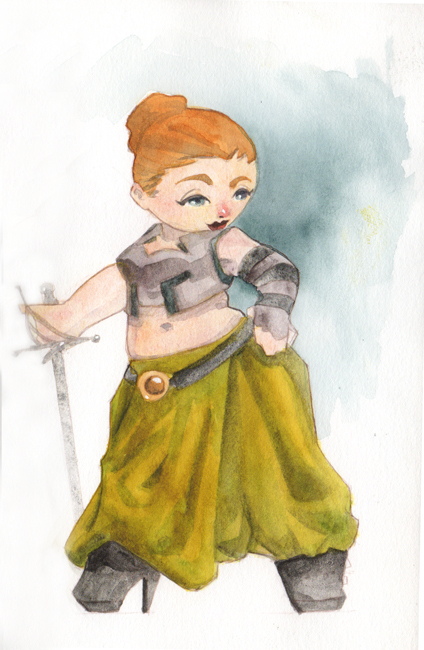 Also, I really enjoyed working in watercolor again. It was fun. I think I’ll have to do this some more. A Different Way of Thinking. I forgot to post this last night — and of course by “forgot” I mean I was up too late and I got too tired to do anything except crawl into bed. I have a tendency to think of things from dark to light and opaquely. I understand glazing and other optical mixing techniques, but I never really use them. So I’ve never really understood how to make watercolor look good. With all of the dark-to-light work I’ve got coming up, I thought (as I often do) it’s good to flex those creative muscles and try something completely different for awhile — I’ll be experimenting with a light-to-dark approach in my free time. I’ll let you know what I come up with.